From cultural performances and galas in the ballroom to networking mixers in the foyer and meetings and workshops in the classrooms, the Asian American Resource Center (AARC) is the perfect location to showcase your next event and create a memorable guest experience. 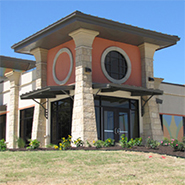 The center is designed as a multi-use facility and can accommodate a wide variety of events. The AARC includes venues such as the grand ballroom which can accommodate 300 for a seated dinner, a full commercial kitchen, the spacious great lawn for outdoor festivals and events, a foyer for receptions and mixers, five classrooms and a conference room equipped with a smart board to increase meeting productivity. The AARC looks forward to hosting your next event and the staff is committed to creating a wonderful experience for you and your guests. Click on the links below for capacity levels, equipment lists, floor plans, photos, and rental rates for each of our rental spaces. What type of events can I host at the center? The AARC is available for a wide variety of indoor and outdoor rentals including community events, non-profit events, business events, meetings, lectures, classes, banquets, and more. The AARC does not rent space for life, family or personal events such as weddings, birthdays, quinceañeras, family reunions and social gatherings. This allows more space availability for community organized events. When can events be held at the AARC? Events can be scheduled between the hours of 7am -11pm Monday - Sunday. Cleanup may not extend past 12am midnight. What are the rental charges and what is included? 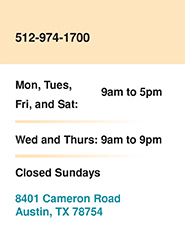 All fees are assessed in accordance with the current City of Austin Parks and Recreation Fee Schedule. Fees will be calculated based on the hourly rental fee and applicable staff and utility fees. In addition to the rental fees, a deposit (converts to damage and cleanup deposit) may be required at the time of the reservation. Are there any spaces available at no-charge? The AARC has two community rooms which are offered free of charge, on a first-come, first-serve basis during regular business hours. These rooms are public spaces and cannot be used for commercial activities or programs that charge a fee. Community rooms can be reserved up to 90 days in advance and used two times per month. Facility reservations are first-come, first-served and may be made up to a year in advance. Potential renters should complete the Facility Rental Application to begin the process. Once your event has been approved, the reservation agreement must be signed and any applicable reservation deposits paid. Viewing of the AARC is available by appointment. Please contact the Event Coordinator to setup an appointment.